The wait is over for Bluegables Farm with the arrival of the first foal of their resident sire Shamoline Warrior. 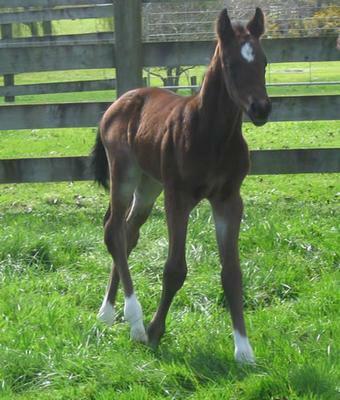 The Waikato nursery welcomed a daughter this week of the Gr 3 Norman Robinson Stakes winner. His athletic filly is out the Street Cry mare Blue Beat, who was a winner and mutliple placegetter from limited starts. Shamoline Warrior was retired to Monty and Judy Henderson's Bluegables Farm in 2011 after injury ended his career. Trained by Mark Kavanagh for leading syndicator, Delbridge Racing, Shamoline Warrior was an autumn debut winner at two and then put aside for his classic season. Shamoline Warrior returned in the Listed Vain Stakes to finish fourth behind the outstanding Starspangledbanner. He subsequently realised his potential with consecutive victories in the Listed Super Impose Stakes and the Gr.3 Norman Robinson Stakes. Shamoline Warrior was on target for the Gr 1 VRC Derby until a chest infection ruled out him out of contention. He was spelled but suffered a torn ligament on his return and a subsequent hairline pelvic fracture forced his retirement.